The Expo Map is folded, full-color detailed map of the SUN ‘n FUN convention campus providing a clear visual guide of key interest areas, guest services, buildings and tent locations. The Expo Map will also have a new look this year, it will be part of the In-Flight Guide as an insert and the layout and fold will change. This new layout will provide an additional ad space opportunity (limited space available), tab ad space on the Expo Map. Take advantage of the prominent Map Tab location while space last. Advertising options include one-eight, one-fourth, one-half, and full page panels. Options also include tab ad space or a full map sponsorship. Over 30,000 copies of the In-flight Guide and Expo Map will be produced. 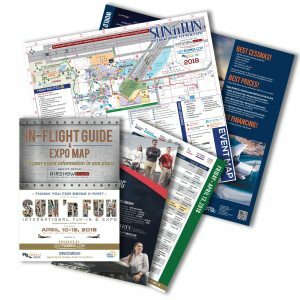 Click here to download the 2019 SUN ‘n FUN Advertising Packet that contains the SUN ‘n FUN Expo Map contract and mechanical requirements.